Modeled on the Heckler & Koch MP5K with the intention of coming up with a compact gun that is easily hidden.This gun was made for body guards and protection teams for close encounters with a rapid fire rate.The MP5 design is a well tried and tested model and this version can be described as a pocket battleship.It is made from tough alloy with a high rate of fire. It is a very decent replica and has a solid feel and looks the part.It is weighty and comfortable in the hands, the fore grip makes sure you can get a decent hold on the weapon for an accurate aim and lay down some fire.The firing modes are semi, fully automatic and safe mode and these are easy change to the mode you require. The CYMA CM 041K MP5K fires rounds at a fantastic speed. 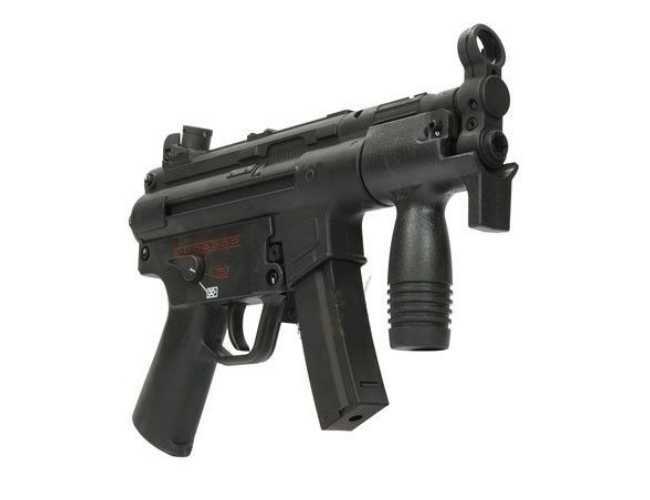 The CM.041J MP5K comes with a Mp5 magazine but other varieties with larger capacities will fit the gun. This pocket battleship of a SMG would suit those wanting a fantastic CQB gun or those looking for a back up with power and house clearing abilities. Good Solid and weighty Feel. Easy to spray bb's all over the place.